With the help of our distinguished professionals, we are capable of manufacturing and supplying a wide range of Underslung Multispan Crane. These multispan cranes are manufactured under the guidance of our experts, who strictly follow the norms and standards already set by the industry. Owing to their high strength and durable finish, these cranes are used in various industries for handling heavy materials. Clients can avail this Underslung Multispan Crane in various options like single span and multi span at reasonable price. Underslung Multispan Crane is the ideal solution when supporting steelwork beneath the crane is not an option. We offer two options which include single span and multi-span options. 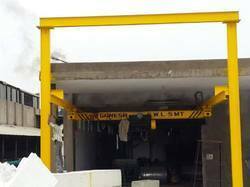 As Underslung Multispan Crane are supported from the roof structure, minimized loadings are usually a requirement. We are catering to the various requirements of our esteemed customers by manufacturing and supplying an assortment of Underslung Crane. The cranes offered by us are manufactured by using advanced technology under the strict guidance of our engineers. Extensively used in medium duty workshop applications, this Underslung Crane is strictly monitored by our team of expert quality controllers. We offer these cranes in various technical specifications in accordance with clientsâ€™ requirement. 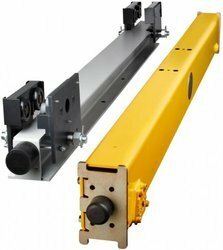 Looking for Underslung Crane ?